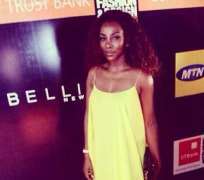 Pretty Nollywood star, Genevieve Nnaji was recently at the Lagos Fashion and Design Week and rocked the event wearing a yellow dress made by a Nigerian designer. The single-mother of one did not fail to reiterate the fact that she is one of the most successful and stylish entertainers in Africa. She graced the red carpet with the dress and got many having a pause to admire her beauty. As we gathered, the dress she wore will hit the stores around June next year. Class you call that? Your guess is as good as mine. African China, A serial Polygamist, Has 168 Kids From Different Women!